Use this fun game for introduction of concepts or review. Students will also be challenged to think and draw conclusions about energy resources and the consequences and challenges of using them. Bingo includes 75 double-sided review cards - one side features a color photograph and key information about a specific energy concept; the reverse side includes a question, challenge or learning statement. 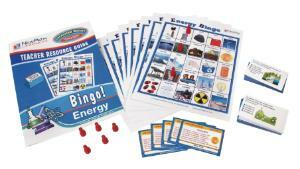 In addition to the review cards, each game includes 30 full-color Bingo cards, 300 markers, and a comprehensive teacher's guide. Printed in color on durable, heavy cardstock, the cards can also be used as standalone flash cards for independent or small group study.